Krishna Kumar Dinesh Karthik ( pronunciation ) (born 1 June 1985) is an Indian wicketkeeper-batsman who made his debut for the Indian cricket team in 2004 and has been a regular member of the team for varying periods since then, including a stint in 2007 as a specialist opening batsman and non-wicket-keeper. Karthik was a batsman in his junior career, but turned to wicket-keeping in order to improve his future prospects. Rising through the junior ranks, Karthik made his first-class debut in late-2002 for Tamil Nadu as a 17-year-old, and was dropped in his first season despite his healthy run-scoring because of his problematic glovework. He fought his way back into the team and after playing for India at the 2004 Under-19 World Cup, made his ODI and Test cricket debut in late 2004. Karthik was the regular wicket-keeper in Tests, making rare appearances in ODIs. During this period, Karthik struggled and averaged less than 20 with the bat, and he was replaced as Test wicketkeeper by Mahendra Singh Dhoni, who had been prolific and destructive with the bat in ODIs, in late 2005. After donning the mantle of an opener for Tamil Nadu and raising himself to the standard of a specialist batsman at domestic level, he was recalled to the national squad as a batsman in late-2006 after injuries and form slumps hit other batsmen, playing occasional matches in both forms of cricket on the tour to South Africa, and scoring a half-century in a Test as an opener. Following India's elimination from the first round of the 2007 Cricket World Cup, the selectors made multiple changes, and Karthik became a non-wicket-keeping opening batsman in the Test team and regularly played ODIs, batting in the middle order. He made his maiden Test century against Bangladesh and then was India's leading scorer in the Test tour of England, helping India to win their first series in England in 21 years. However, Karthik suffered a form slump in late-2007 and was dropped from the Test team, and since then has only made sporadic international appearances, although he continues to score heavily in domestic cricket. These have come in occasional appearances as a specialist batsman when other players were rested or injured, or as a wicket-keeper when Dhoni was sidelined. He was born to a Telugu Naidu Family, Karthik began playing cricket at the age of 10, after a two-year stint living in Kuwait, where his father Krishna Kumar worked. He studied in Fahaheel Al- Watanieh Indian Private School while in Kuwait. Karthik was taught by his father, a first-division cricketer from Chennai. Disappointed that his own career was hindered when he was forced by his family to put his education first, Karthik's father did not want his son to suffer the same way, and trained him hard from an early age. Karthik honed his reflexes at this young age by having his father throw hard leather balls at him at high speed. Initially he played in the youth teams for Tamil Nadu as a batsman who was learning to keep wicket, and was regarded by Robin Singh as having very high levels of fitness. Karthik steadily ascended the youth ranks. He made his debut for Tamil Nadu Under-14s in early 1999, and after scoring 78 and 26 in his two interstate matches, was promoted to the Under-16 team in November, still less than 14 and half years old. After spending the entire 1999–2000 season in the Under-16s, he was promoted to the Under-19 team at the start of the 2000–01 season, aged 15 years and 3 months, despite scoring only 52 runs at 10.40 at Under-16 level and still being eligible for that age group. The selectors’ decision did not result in increased productivity from Karthik; he scored 133 runs at 22.16 in seven innings with a top-score of 39, and was demoted back to the Under-16s in November, and responded immediately with 124 in his first innings against Karnataka. He added two further fifties in the season, including a 99 against Kerala. Karthik ended with 367 runs at 52.42 for the season. Karthik regained his position in the Under-19 team at the start of the following season, which he opened with 150 against Goa. After scoring 314 runs at 46.42 in eight matches, he was promoted to the Under-22 team and made 78 runs at 39.00 in five matches. Karthik was rewarded with selection for South Zone, which represents the country’s south, in the Under-19 zonal competition. He was not a success with the bat, scoring 0, 1 and 2 in his 3 innings. In April 2002, Karthik was selected to play against the touring Australian Cricket Academy, and scored 125 in the second of two matches. At the start of the rest of the 2002–03 season, Karthik began to make an imposing case for senior selection. In his opening match of the season for the Tamil Nadu Under-19s, he scored 227 in his team’s 392/7 against Goa, and after making a duck in the first innings against Hyderabad, he hit 126 not out in the second innings. He then registered his third century in four innings, cracking 235 against Andhra Pradesh. His form tapered off and he only made 111 runs in his next six innings, but was nevertheless called up to the senior team to make his first-class debut. Karthik made his debut at the first-class level in late-2002 against Baroda, playing as a wicket-keeper and batting at No. 8, where he scored 37. He batted throughout the round-robin phase in five matches, scoring 179 runs at an average of 35.80 with a top score of 88* against Uttar Pradesh in his second match. This innings helped Tamil Nadu to avoid an outright defeat, hanging on for a draw with one wicket in hand. However his form tapered off after this match and he failed to pass 20 again during the season. He took 11 catches, but due to his repeated wicket-keeping errors, he was dropped for the final matches. After being dropped from the senior state team, Karthik was overlooked for the selection in the zonal Duleep Trophy, and played in the Under-19s for South Zone. He had a more productive time in his second zonal season, scoring 180 runs at 60.00 with three half-centuries. He was rewarded with selection in the national Under-19 team, and played in three youth one day internationals (ODIs) against Nepal. He made only 51 runs at 17.00 without taking a catch, but India won all their matches with ease. Karthik attended a wicket-keeping camp in the off-season under the guidance of former Indian glove-man and chairman of selectors Kiran More, which he credited for improving his technique. After playing for a period in the Chennai League, he returned to the Under-22 team at the start of the season, before being selected for India Emerging Players to play their youthful counterparts from Sri Lanka and Pakistan in late-September. He made 50 runs at 16.66 and took nine catches in three limited overs matches, and then made 35, 7 and 77 for the national Under-19s in some ODIs against the other Asian countries. After these performances, Karthik was recalled to the Ranji Trophy team at the start of the 2003–04 season. This time, he accumulated 438 runs with an average of 43.80, with two centuries, and took twenty catches. After opening the batting for much of the round-robin phase, and struggling with only 159 runs at 19.87 in four matches, Karthik then played in the zonal Under-19 one-dayers, managing only 28 runs in four innings. Karthik returned to the middle-order for the semi-final against Railways, scoring his maiden first-class century of 122 to help his team take a first innings lead. He followed this with 48 in the second innings, to help Tamil Nadu progress to the final on the basis of the first innings after Railways held on for a draw still more than 300 runs short of their target. He followed this with an unbeaten 109 in the final against Mumbai. His innings was the mainstay of Tamil Nadu’s 294, but Mumbai made 613 to take a first innings lead. Tamil Nadu made 4/393 in the second innings with Karthik not batting, but the first innings lead in the drawn match gave Mumbai the title. Karthik ended with three catches in the innings. However these performances were insufficient to gain regional representation, and he was overlooked for South Zone's matches in the Duleep Trophy. Karthik returned to domestic cricket at the conclusion of the Tests in 2006, while his colleagues played in the ODIs, and played in two Ranji Trophy matches for Tamil Nadu, scoring only 100 runs at 25.00 in four innings. Karthik was selected in the India squad for the 2004 U-19 World Cup in Bangladesh, where he scored 70 runs from 39 balls against Sri Lanka. This helped set up a 56-run win and propelled India into the semi-final, where they were knocked out by Pakistan. Karthik made only seven as India were skittled for 169. He ended the tournament with 163 runs at 32.60. He then scored two half centuries on an India A tour to Zimbabwe, making 96 and 52 against Zimbabwe Select XI. In January 2005, a series of one-day domestic tournaments were held, and Karthik had a chance to press his claims for selection in that format, having never played more than three List A matches in a sequence. In five matches for Tamil Nadu, he only had three innings, but scored 72 and 80 in two of them. He was then called into South Zone’s senior team for the first time, to play in the zonal one-day competition. He scored 106 runs at 26.50 in four outings for the southerners. In the Challenger Trophy, Karthik played for India A against India B and India Seniors, and made little impact, scoring 17 and 3. He then played for South Zone in the first-class Duleep Trophy, but continued to have modest returns with the bat, scoring 101 runs at 25.25 in two outings, although he was run out in one innings after making a start and reaching 59. Karthik was not selected for the ODIs against Pakistan and returned to action in one-dayers for Tamil Nadu in the meantime, but managed only 59 runs at 19.66 in three matches. Karthik returned to India after Zimbabwe tour in 2006 and made 26 and 11 in the Challenger Trophy for India A, which was not enough for him to force his way into India’s squad for the home ODIs against Sri Lanka and South Africa. In the meantime, he played in the Duleep Trophy and had the chance to make his case for Test retention. However, he scored only 106 runs at 26.50 in two matches and South Zone lost both of these and were eliminated, and Karthik spent the next month on the sidelines. Karthik continued to play for Tamil Nadu in the Ranji Trophy, but only scored 30 in his first four innings of the season. This dropped him down the pecking order as Patel was favoured as the reserve wicket-keeper on the 2006 tour to Pakistan. Immediately after the announcement, Karthik scored 134 against Mumbai in a losing effort, but was unable to back up with any scores beyond 50 in his five remaining innings in the competition. Karthik had mixed results in the domestic one-day competitions in 2008 or so. He scored only one half-century in six matches for Tamil Nadu, a 79, and one further fifty in three matches for South Zone, ending with a total of 209 runs at 23.22. At the start of the 2006–07 season, Karthik scored 11 and 85 for India Red in the Challenger Trophy. He then played in two Duleep Trophy matches for South Zone, scoring 95 in the latter against Sri Lanka A. After struggling in recent months in the limited overs format, Karthik bounced back during the Challenger Trophy at the start of the Indian domestic season. Playing for India Blue, he made a duck in the first match, but then made 65 against India Green and an unbeaten 116 in the final to guide his team through a successful run-chase against India Red. He then rounded off his preparation for the next Test series with consecutive fifties for Tamil Nadu in the Ranji Trophy. Upon his return to India in 2007, Karthik played in six one-dayers for Tamil Nadu and South Zone, reaching 40 twice in six innings. Following the loss of his place in the Indian team in 2009, Karthik returned home and played for India A in a series of one-dayers against their counterparts from Australia and New Zealand, and then for India Blue in the Challenger Trophy. He had an unsuccessful campaign, accumulating only 70 runs at 11.66. He then had a strong domestic first-class season in 2008–09. After starting the Ranji Trophy campaign with two single-figure scores, he scored 213, featuring in a 213-run partnership with Subramaniam Badrinath as Tamil Nadu defeated Uttar Pradesh by an innings. Karthik then scored 123 and 113 in consecutive matches against Baroda and Railways before ending his Ranji Torphy campaign with 72 against Uttar Pradesh in the return match. He then continued his strong run against Central Zone in the Duleep Trophy, scoring 153 and 103 in one match. Karthik ended with 1026 runs at 64.12 for the season, including five centuries and two fifties. Sehwag and Yuvraj recovered in time for the home ODI series against Australia in 2010, so Karthik returned to domestic duty at the start of the 2009–10 season. He played in Delhi's four matches in the 2009 Twenty20 Champions League, scoring 92 runs at 23.00, including a top-score of 61 against Sri Lanka's Wayamba. Delhi were knocked out in the Super 8 stage. Karthik played in six Ranji Trophy matches for Tamil Nadu as captain, and he had an uneven run of scoring with the bat. He scored 152 against Orissa and 117 against Punjab, and added a further two scores of at least 70, but managed only 16 runs in his four other innings. Karthik ended the season with 443 runs at 55.37. He also resorted to bowling himself twice, when matches were proceeding towards a draw, with no success; he delivered 14 overs and conceded 97 runs in all. However, Karthik was not to lead Tamil Nadu into the knockout stages of the competition. 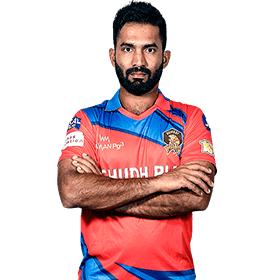 Dinesh Karthik played in the 2016 Tamilnadu Premier League as the wicket-keeper and captain for Tuti Patriots, who took a break from the West Indies tour 2017 and didn't feature in the first three Tamil Nadu Premier League (TNPL) matches 2017, was back leading Tuti Patriots.The 32-year-old feels that batsmen are playing fearless cricket in TNPL-2. "In terms of chasing totals, the team is extremely professional. 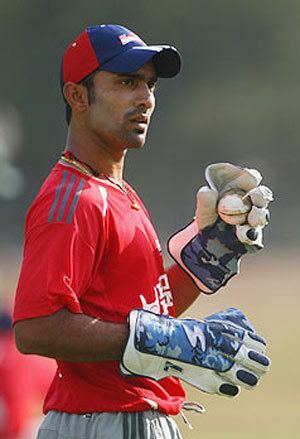 Karthik played in the 2008 Indian Premier League as the wicket-keeper for the Delhi Daredevils, scoring 145 runs at 24.16 with a strike rate of 135.51. His highest score was an unbeaten 56 to steer Delhi to a five-wicket win in a group match over the Mumbai Indians. In a match against the Deccan Chargers, team-mate Amit Mishra took a hat-trick, and when the new batsman came in, he charged out of his ground and missed, only for Karthik to miss the opportunity for the stumping and double hat-trick. In the 2009 Indian Premier League held in South Africa, Karthik played in each of Delhi's 15 matches, scoring 288 runs at 36.00, passing 40 on three occasions and making 17 dismissals. Delhi topped the pool stage of the tournament, but Karthik made only nine in the semi-final as Delhi were defeated by six wickets by the Deccan Chargers. 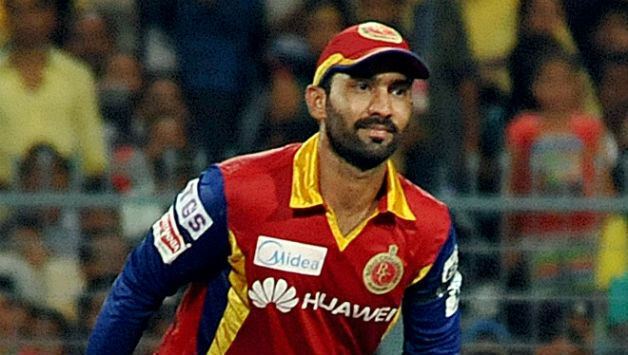 For 2012 Indian Premier League Dinesh Karthik transfer to Mumbai Indians from Delhi Daredevils. In the 2013 Indian Premier League, Karthik had some good starts for the Mumbai Indians, in the early matches: in particular, when he scored a quick 86 against the Delhi Daredevils in their home match at the Wankhede Stadium. The Mumbai Indians went on to win their first IPL trophy this season with Karthik batting and wicket-keeping in all 19 of their matches. In almost all the matches he batted third and was seen as a key run getter for the team. He ended the tournament with 510 runs and was within the top 10 run scorers of the tournament. Karthik made his Test debut in the 4th Test between Australia and India in Mumbai, when Parthiv Patel was dropped following a poor run of form with the gloves. He only managed 14 in two innings and two catches, but was praised for his wicket-keeping on a pitch with variable bounce and spin in which 40 wickets fell in two days’ playing time. Karthik tasted victory immediately as India scraped home by 13 runs. He played in only one match against England at Lord's, where he got out after scoring one run. Despite dropping England captain Michael Vaughan from the bowling of Anil Kumble, he eventually stumped Vaughan down the legside and took another catch. He played another match in the 2004 ICC Champions Trophy against Kenya, taking three catches as India persisted with Dravid's wicket-keeping for the majority of the English tour. Karthik was not required to bat as India only lost four wickets in their innings. He was subsequently replaced in the ODI team by Mahendra Singh Dhoni, who took over the gloves from Dravid on a full-time basis; Karthik did not play another ODI until April 2006. Karthik was retained for India’s next engagement, a two-Test home series against South Africa. In a high-scoring draw in which both teams passed 450 in the first innings, Karthik managed only a solitary run in the First Test in Kanpur. In the Second Test in Calcutta, he scored 46 to help extend India’s first innings lead to 106 runs, as the hosts completed an eight-wicket win. Karthik had a chance to score heavily in India’s two-Test tour of Bangladesh in December 2004. Against a team that had never won a Test, India encountered little difficulty in sweeping the series, winning both matches by an innings. They passed 500 in both matches, but Karthik was unable to join the high-scoring, managing only 25 and 11. Despite these lean performances, Karthik was retained for the three-Test series at home to Pakistan in March. In a high-scoring draw in the First Test in Mohali, Karthik made only six as India amassed 516. Karthik then put on his best Test batting performance to this point, at Eden Gardens, Kolkata against Pakistan. India batted first and Karthik made a start and reached 28, before being run out. India made 407 and Pakistan almost broke even, replying with 393. In the second innings, Karthik scored, combining with Rahul Dravid in a 166-run partnership to set up a target of 422. This proved too much for the tourists on the deteriorating pitch and India won the match by 196 runs. In the next match, he made only 10 and 9 as India collapsed and lost ten wickets on the final day of an otherwise high-scoring match—1280 runs had been scored for only 22 wickets in the first three innings. In contrast, Dhoni scored 148 in an ODI against Pakistan and kept his position as the ODI gloveman safe. Despite Dhoni’s heavy run-scoring in the ODIs, the selectors continued to persist with Karthik for the Tests in the face of his low scoring at both domestic and international level in the preceding 12 months. Karthik started the tour of Zimbabwe with 40 in a warm-up match against the Zimbabwe Board XI. The hosts, depleted due to political purges conducted by their government, were no match for India and lost by an innings and ten wickets respectively. India scored heavily against their weakened opponents, amassing 554 and 366 in their completed innings, but Karthik failed on both occasions, twice making a single. When the team for the three Tests at home to Sri Lanka was announced, Karthik was dropped in place of Dhoni. In ten Tests since his debut, Karthik had managed only 245 runs at an average of 18.84 with only one half-century and one other score beyond 25. In contrast, Dhoni's had been a prolific run-scorer in ODIs, and had won the man of the series award against Sri Lanka and scored 183 not out in one match. With India's batsmen struggling, Raina and Kaif were dropped altogether from the Test squad, as Karthik was selected as a back-up wicket-keeper and middle order batsmen in the Test team for the first time in a year. After Dhoni suffered from a finger injury, Karthik replaced him for the Third Test at Newlands against South Africa, playing in his first Test in over a year. With regular opener Virender Sehwag suffering from a loss of form, Karthik opened the innings with Wasim Jaffer, allowing Sehwag to bat in the middle order. He used his domestic experience to score 63 in the first innings, combining in a century opening stand, helping India to 414, enough for a first innings lead of 41. In the second innings, he scored an unbeaten 38, as the team suffered a batting collapse and were all out for 169, allowing the hosts to take the series 2–1 by five wickets. In addition to his batting, his wicket-keeping was praised and brought former South African fast bowler Allan Donald to predict further success in the future. Karthik did not play a match at the 2007 ICC Cricket World Cup, and following India's unexpected exit from the first round, a group of players was dropped from the squad, including Sehwag. 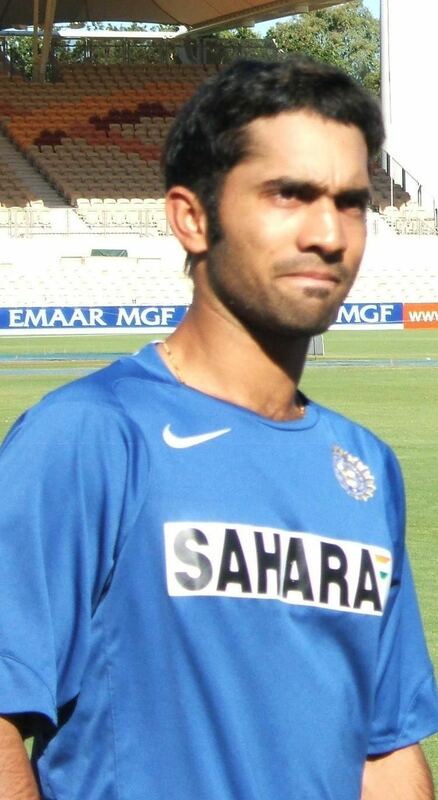 As a result, Karthik was selected as a specialist opener for the tour of Bangladesh, scoring 56 and 22 in the drawn First Test in Chittagong before scoring his maiden Test century in the Second Test in Dhaka, compiling 129 runs and featuring in a century opening stand as India took an innings victory. Karthik established himself as a regular opener in the mid-2007 Test series in England. After scoring 76 and 51 in the two tour matches ahead of the Tests, he recorded a half century in each of the three Tests, regularly helping India to make solid starts. In the First Test at Lord’s, Karthik made 60 in the second innings before India fell to 9/282 in pursuit of 380 when rain ended the match early. In the Second Test at Trent Bridge, Karthik scored 77, helping to lay a top-order platform for India’s first innings of 481, which gave them a 283-run lead. He then scored 22 as they reached their target of 73 to take a winning series lead. In the Third Test at The Oval, Karthik scored 91 as India batted first and helped to lay the foundation for their total of 664 and a first-innings lead. This was enough to secure a 319-run first innings lead, and although India were unable to finish England off, it was enough to secure a 1–0 series win. With a total of 263 runs at 43.83, he was the highest scorer in the series for India, as the tourists won their first series in England for 21 years. He started the ODI series with an unbeaten 44 in the first ODI as India capitulated to 184 all out and a 104-run defeat, but thereafter had four consecutive innings where he failed to score more than four runs, and he was dropped for the final two matches. Karthik had a lean Test series against Pakistan at home in late 2008. In the first two Tests, he managed only 39 in two innings, passing single figures only once. In the Third Test in Bangalore, Sachin Tendulkar was injured, and his replacement Yuvraj scored 170. Karthik, batting down the order with Gautam Gambhir taking his opening position, scored 24 and 52 in a high-scoring draw and kept wickets because of Dhoni's absence with injury. In the first innings, Karthik was behind the stumps as India set a world record for the most extras conceded in a Test innings. The 35 byes that were leaked were the second highest amount in Test history. India won the First Test and the other matches were drawn. Karthik was retained for the Test tour of Australia as an opener, while Gambhir was ruled out after suffering an injury. However, he did not play in the first two Tests, because Dravid was elevated into his opening position so that both Tendulkar and Yuvraj could bat in the middle order. When Dravid and Yuvraj both struggled in their new positions, Dravid was moved back to his No. 3 position and Yuvraj dropped for the Third Test of the series, but instead, it was Sehwag—who had earned a late call-up as the reserve opener after Gambhir succumbed to injury—and not Karthik who was recalled. During the Test leg of the tour, Karthik played in only one non-first-class match against an Australian Capital Territory Invitation XI, scoring 25 and 97. Karthik was selected for the limited overs component of the Australian tour, but did not play in any of the ten ODIs. This meant that in almost three months on tour, Karthik only played in a two-day match and a Twenty20 match against Australia, in which he scored eight runs. He was recalled to the Test team as a wicket-keeper for the July 2008 tour of Sri Lanka after Dhoni chose to take a break from cricket, citing the need to rest. Karthik played in the first two Tests, but struggled with the bat in the middle-order, scoring 36 runs at 9.00, falling all four times to the spinners Muttiah Muralitharan and Ajantha Mendis. He also dropped frequent catches and he was replaced for the Third Test by Patel. In 2009, he scored an unbeaten 117 against Kerala in the one-day tournament and was selected for the tour of New Zealand as the reserve wicket-keeper. After watching the entire T20 and ODI series from the sidelines, he played in the Second Test after Dhoni was injured, but he was criticized for dropping multiple catches as the hosts amassed 9/619 and made only six in his only innings. Karthik then played in the First Test at Chittagong after Dhoni was forced to withdraw due to injury. He made a duck in the first innings as India stumbled to 243 on the first day. He then made 27, falling in pursuit of quick runs for a declaration after India recovered in the second innings. India went on to win the match, and Karthik watched the next match from the sidelines after Dhoni recovered and steered India to a clean sweep. Karthik was then displaced as the reserve gloveman for the two-Test home series against South Africa; Wriddhiman Saha was called up to be Dhoni's deputy. Karthik scored 183 and 150 in the Duleep Trophy final against West Zone, becoming the third player after Lalchand Rajput and Yuvraj Singh to score centuries in both innings of a Duleep Trophy final. However, it was not enough as Yusuf Pathan scored an unbeaten 210 from only 190 balls to set a new world record for a successful run-chase. In April 2006, Karthik's career was revived when he was recalled to the ODI team by selectors to give Dhoni a rest in the final ODI against England in Indore. He was not required to bat as India cruised to a seven-wicket victory. He was then reinstated as the reserve wicketkeeper for the tour to the West Indies. after a campaign for India A during April in which he scored 134 runs at 33.50, including a man-of-the-match 75 runs against UAE on a tour to the gulf country. However, Karthik had little to do on his Caribbean sojourn, playing in only one non-first-class tour match ahead of the Tests. Karthik was given more opportunities at international level in late-2006 during the ODI tour of South Africa, after Yuvraj Singh was sidelined with a knee injury, and Karthik was given a spot purely as a batsman following the poor form of Suresh Raina and Mohammad Kaif. Karthik had opened the batting for Tamil Nadu in the previous season in the Ranji Trophy, as well as for South Zone in the Duleep Trophy. Playing in three of the ODIs, Karthik himself struggled, with 42 runs at an average of 14.00, and a top score of 17 as South Africa took a 5–0 whitewash. Karthik then scored an unbeaten 31 to steer India to a six-wicket win in the Twenty20 International against South Africa with one ball to spare in 2007. Karthik then featured in the four-match ODI series against West Indies, and after not batting in the victory in the first match, he top-scored with 63 as a specialist batsman when India recovered from 35/3 to post 189 on a slow wicket at the Barabati Stadium in Cuttack. India went on to win by 20 runs, giving Karthik his first man of the match award. He was rewarded with continued selection for the subsequent series against Sri Lanka and the 2007 Cricket World Cup. However, Karthik faltered in the series against Sri Lanka, managing only 31, 4 not out and 1, leaving his position in jeopardy. In two warm-up matches in the West Indies before the start of the World Cup, Karthik scored 3 and 38 not out against The Netherlands and the West Indies. Prior to their tour of England, India played a series of ODIs in Ireland, against the hosts and South Africa. Karthik played in four matches, scoring 15 runs at 51.00 and keeping wicket in two of the matches. Karthik was selected for the inaugural 2007 ICC World Twenty20 in South Africa in September 2007, and played in India's earlier matches, scoring 11, 17, and a duck, before being dropped from the semi-final and final in favour of Rohit Sharma. India went on to win after starting the tournament as outsiders. Karthik kept his place in the Indian squad for the home ODI series against Australia but was on the outer after his decline in form in England, and played in only the final match in Mumbai, making a duck as India scraped home by two wickets. He got a chance again in India's four match tour of West Indies where he replaced opener Sehwag, who was out with a shoulder injury. He scored 67, 4 and 47 as an opener which could help him claim a berth for the future, as India took the series 2–1. With Sehwag still injured, he was retained for a short triangular ODI tournament in Sri Lanka in September. He scored 4 and 16 in India's two round robin matches and was dropped for the final, in which India triumphed over the hosts. Karthik was retained for the 2009 ICC Champions Trophy in South Africa, but after his performances in Sri Lanka, was omitted for the first two matches. He was given an opportunity in India's final pool match against the West Indies and scored 34 in a seven-wicket win, but it was not enough to prevent India's first round exit. In December 2009, Karthik was recalled to the ODI team during the Sri Lankan tour of India after Dhoni was banned after the second match for two matches because of slow over rates. Karthik kept wickets in the next two matches, scoring 32 and 19 and remaining unbeaten in both instances, helping to guide India to the target in successful runchases. He retained his place as a middle-order batsman in the fifth and final match when Dhoni returned after Tendulkar was rested and Yuvraj injured, but the match was ended prematurely due to an unsafe pitch. Karthik retained his place for the ODI tri-series in Bangladesh against the hosts and Sri Lanka after Tendulkar was rested for the tournament. Karthik played as an opener along Gambhir in the last two of the round-robin matches after Sehwag was rested. Karthik made 48 and 34 in quick time as India won both matches but was dropped for the final, which was lost. Karthik was recalled to the Indian ODI team for the 2013 ICC Champions Trophy following a great domestic season and IPL performance. He scored back to back centuries in the two warm up games sealing his place in the team for the tournament. Unfortunately these centuries will not be counted in his first class statistics as the teams were playing a 15- side team. He scored an unbeaten 51 in India's group match against the West Indies. 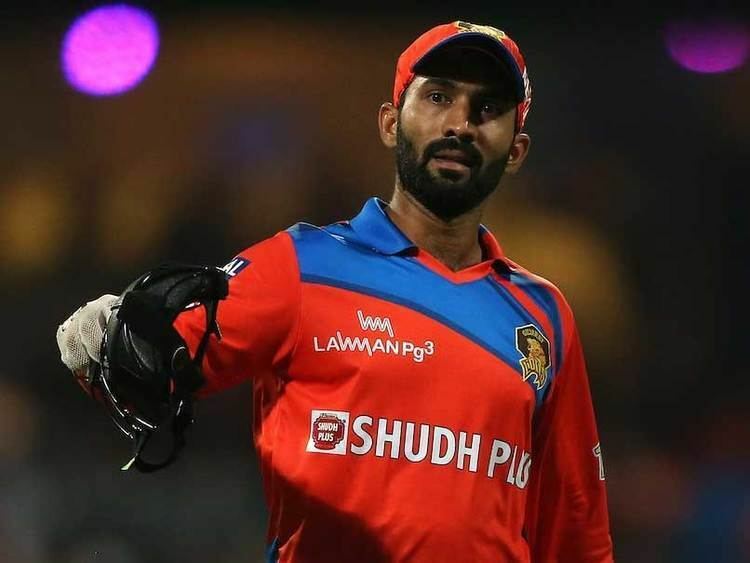 Dinesh Karthik was married to Nikita Vanjara.She got divorced from Dinesh . On 18 August 2015, Dinesh married Indian squash player Dipika Pallikal Karthik in Chennai. His father is Krishnakumar and mother is Padma. Dinesh has a younger brother called Vinesh. Karthik took part in the dance reality show Ek Khiladi Ek Hasina partnering with Nigaar Khan.